1. Fry bacon slowly and drain thoroughly. 2. Spread toasted bread slices with mayonnaise. 3. Lay tomato slices on every other slice of bread. 4. Sprinkle tomatoes with salt and pepper. 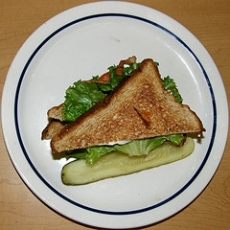 Top with bacon, lettuce leaves and the other bread slice. 5. Cut on the diagonal and serve with soup, chips or french fries. This recipe is high in Vitamin A with 229% of your daily recommended intake per serving. This recipe is high in Vitamin C with 179% of your daily recommended intake per serving. This recipe is high in Vitamin E with 20% of your daily recommended intake per serving. This recipe contains potential food allergens and will effect people with Wheat, Gluten, Tomato, Beef allergies.